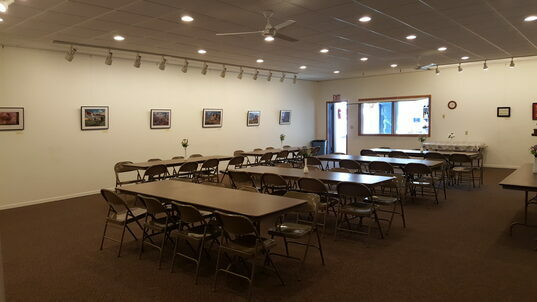 The cost of the room for weekends and evenings is $60.00 for four hour rental. This fee includes unlocking and locking the museum. Additional time will be pro-rated at $10.00 per hour. Members of the Cottonwood County Historical Society receive a 10% discount. Please schedule with the Staff the hours you require to accommodate decorating and/or food preparation. Leave the kitchen and dining room as clean as when you started. A vacuum is stored in the meeting room storage area for your use if the carpet needs sweeping. We strongly recommend no red punch. Carpet stain remover is located in kitchen to remove any stanins to carpet that occurred during your event. Scotch tape will often remove paint from the walls-DO NOT USE! Museum staff will provide an adhesive. Any damage will be billed to the party renting the space. We do recycle at the museum and encourage you to separate out the cans and plastic. Please rinse the items to be recycled and place in a paper or plastic bag. Leave the regular trash in the kitchen. Garbage bags are provided by the museum.